This snack is so easy to make that even if you are in the midst of a real hunger-panic, you should have no problem throwing it together to satisfy your need for a snack. No cooking, no food prep, super tasty – what’s not to like? Even better, it’s completely free from sugar and virtually carb-free too so you won’t derail your diet. The protein and fat also ensures you are going to stay fuller for longer. Note: If you’re looking for a serious recipe book with low sugar recipes I highly recommend you the one by Diane Sanfilippo. It’s called 21 Day Super Detox. It’s a complete program with low sugar recipes, to help you to get rid of sugar. My complete review is here. Place one slice of the ham on a plate and lay a slice of cheese on top. Put one spring onion on the edge of the ham/cheese and spread half the mayonnaise over. 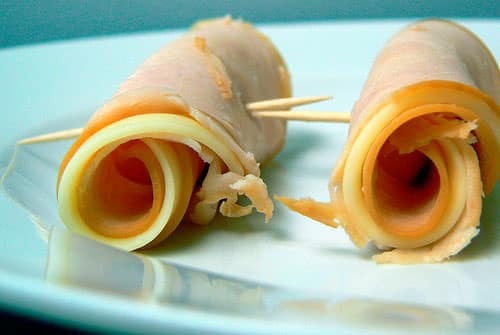 Roll up and then cut in half. Repeat this process with the other ham and cheese slice. Thanks for your comment ! Yeah home cooking is the way to go ! I would recommend 2 to 3 days maximum on the fridge. Good luck for your journey !